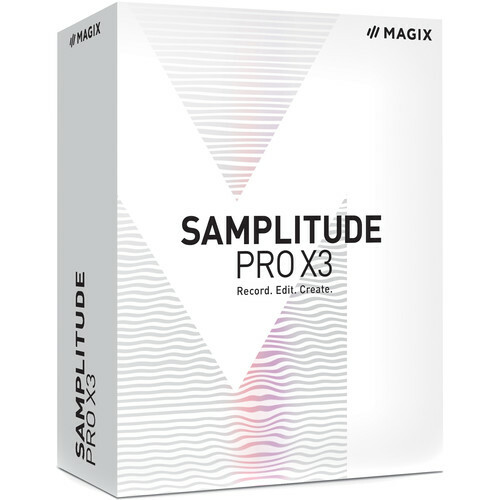 Samplitude Pro X3 from MAGIX Entertainment offers musicians, sound engineers, and producers a powerful virtual studio environment for creating music from the original idea to the final master. The software features a 64-bit hybrid audio engine, powerful multi-core support, up to 256 physical inputs/outputs, and 999 tracks of audio and MIDI data. It delivers a transparent and nuanced sound with low latency, intuitive mixing capabilities, and flexible routing, ideal for large and complex recording projects. Samplitude Pro X3 includes Celemony Melodyne Essential with ARA extension, which enables a closer interaction between the two software, for editing pitch and tempo with absolute precision. Also, included for composing your songs is the Independence sampler with more than 12GB of content, as well as a wide selection of virtual drums, synths, keyboards, and more. For mixing, the software offers VCA faders with the feel of an analog console, precise automation of tracks and plug-ins, and several suites of essential and vintage EQ, dynamic, modulation, and delay effect plug-ins. Other features include track-level spectral editing which lets you remove unwanted noises without affecting the original signal, and mastering tools such as the sMax11 Brickwall Limiter, the Multiband Enhancer, and the Analog Modelling Suite.